Lindsay Sowa graduated from the University of Florida (UF) Department of Industrial and Systems Engineering’s (ISE) Outreach Engineering Management (OEM) master’s program in 2016. The OEM Program was specifically developed for working professionals with interest in a master’s in ISE with a concentrated emphasis in engineering management. In this article, Sowa tells us how this program contributed to her current career success. Sowa is currently Manager of Facilities Operations Services for Environmental Programs at Walt Disney World. She was recently promoted to this position and explained that the OEM program gave her confidence to take-on the leadership role. She said that the combination of industrial engineering and business administration coursework not only strengthened her technical capabilities but also strengthened her management style and catapulted her career to the next level. Sowa offered that the OEM program allowed her to pursue new responsibilities and challenges within her company. In a recent interview with ISE Marketing Specialist, Tori Bryan, Sowa talked about her educational career and the specific steps she took that led her to where she is today. What about the OEM program stood out to you during your research process? What was it about having the management component that you enjoyed? Let’s back track a little. Tell me a little about your undergrad experience. How did you first become passionate about Engineering? 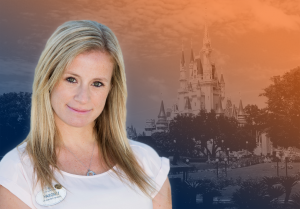 How has this passion morphed into your career at Disney? “I have been with Disney for almost twelve years now, and within that time I have had four different roles. I started off as a design engineer as part of the mechanical, electrical, and plumbing team, and I was involved in the design and design management of facility mechanical systems such as HVAC, plumbing, and fire protection systems. After six years, I transitioned over to the animal sciences and environment line of business and became a part of the water sciences team as their project manager and engineer. This team was responsible for all management and operations of all water exhibits containing managed animal life within the company. It was interesting at the time because growing up I thought I wanted to be a veterinarian, and now I was able to combine my two passions, which is something I never knew was a possibility. Next, I joined the facility asset management department and I was a project manager with that group. I was positioned on the Epcot team, responsible for construction project management and implementation of projects within Epcot. If you could go back and change your education and career path, would you? How does it feel to be a Gator alum? The ISE OEM program recently celebrated the graduation of it’s 20th group of professional students. The program was started in 1996 and truly embodies the founding concept for the UF ISE Department, including providing advanced education in engineering combined with management coursework. To date the program has educated a total of 756 students. OEM graduates work in a broad range of industries, including manufacturing, construction, entertainment, education, defense and more. All our graduates have achieved major career accomplishments demonstrating the high caliber of individuals having completed the program as well as the quality of OEM instruction. The Program looks forward to many years of continuing operation as a leading engineering management masters program.